Welcome to the November Damask Divas blog hop. This month we are featuring the Huntington paper pack from Close to my Heart. If you got here from Traci’s blog you are in the right place. If you want to start from the beginning or see the list of all participating CTMH Damask Divas bloggers, click here to go to the Damask Divas blog. 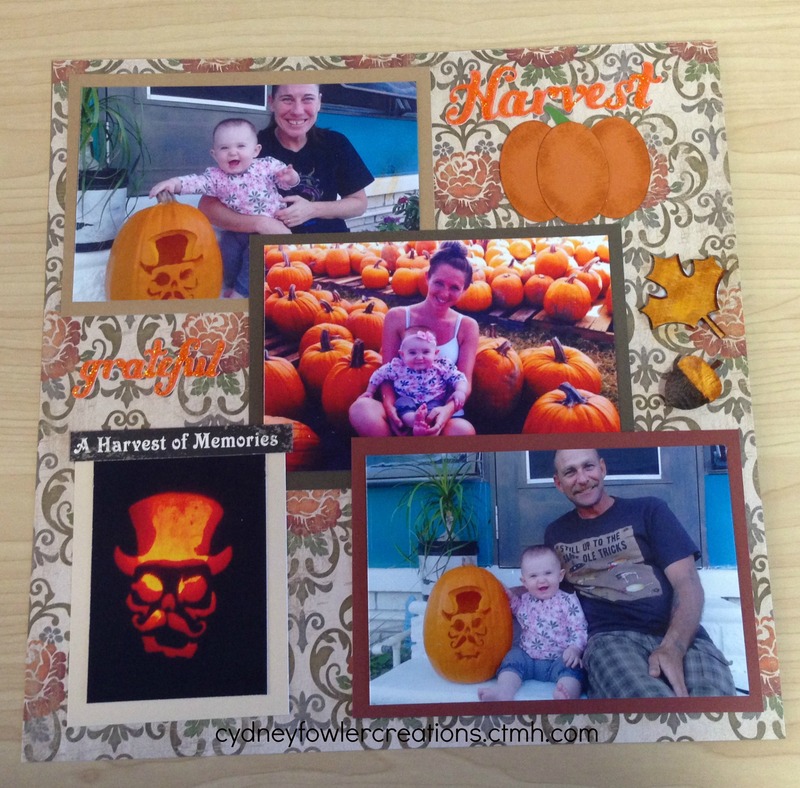 This paper is perfect for Autumn memories so I made a single page layout using photos that my sister and her family posted on Facebook. My great-niece took her first trip to the pumpkin patch with my niece and then spent some time with her grandparents (my sister and brother-in-law). They live in Florida so they don’t have the autumn chill to deal with but they still have pumpkins! My brother-in-law, Danny, did an awesome job on the pumpkin carving and the photo of the lit pumpkin adds just a touch of spooky! The papers are all from the Huntington pack except the pumpkins and words I added. I used the CTMH Cricut Artbooking cartridge for the words and the CTMH Cricut Art Philosophy cartridge for the ovals in the paper pumpkin (oval3). I had the words and ovals on hand since I cut a lot to use on cards and tags. I added some ink to the wooden arbor shapes. The saying “A Harvest of Memories” is a zip strip from another pack (can’t remember which one – I save them all and use them when I need to add a little something). If you are interested in browsing or buying on my CTMH website click here or go to http://cydneyfowlercreations.ctmh.com or visit your own consultant’s site if you have one. Any of us are happy to be your consultant and help you to create your own memories! Happy Crafting! Next on the hop is Amanda’s blog. Click here to go to her page and see what she has created with this beautiful paper pack! Great layout…and great work on that pumpkin!